Wolfe and Archie in good form in an original and very entertaining story. 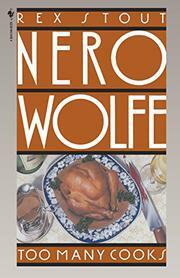 Nero Wolfe is persuaded out of his New York home by a meeting of fifteen master chefs in a West Virginia resort, and is on the scene when the jealousies and friendships among the world's famous chefs provide the setting for a murder. Gourmet gossip, which is fun reading (and for those seriously interested sustained by a supplement of recipes).